One of our club's defining moments was when the team, led by Sri Chinmoy in person, went to Chico to run the marathon on March 3rd 1979. Sri Chinmoy came from a decathlon background, his strongest event being the sprint, so this first attempt at a 26.2 mile race was a radical change and an inspiring new challenge for him. Ever since, the club has remembered the anniversary of this first marathon with visits to Chico and runs in other parts of the world. 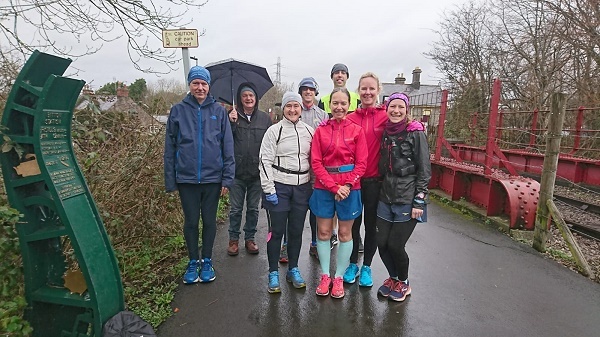 The 40th anniversary fell on Sunday so across the world small groups of runners set out to run in honour of Sri Chinmoy's marathon debut. I measured a course on the Bristol & Bath Cycle Path using a properly calibrated Jones-Oerth Counter - it was exactly one sixth of a marathon so to run out-and-back three times would be the full 26.2 miles. As well as a handful of Bristol runners we were joined by Bhauliya from Scotland and Shankara & Petra from London. My training for this one had consisted of two long runs a- a 12 miler and a 16 miler - plus my usual regime of exercising most days on the bike, in the pool or at the climbing wall. Most weeks I run once or twice and every few weeks I get in a race of 10k or 2 miles where I push myself pretty hard. That hardly constitutes marathon training but the 16 miler, run at 10 minute pace with walk breaks, had given me the confidence that I might actually complete the distance. My last marathon was in 2009 and since then I'd done long bike rides and triathlons but never a really long run. My illness back in 2012 had been followed by a lot of injury hassles and an inability to sustain any kind of decent weekly running mileage, so I was excited and nervous at the same time. Would I just break down with injury problems - achilles tendonitis, calf strain, plantar fasciitis? I'd had all those on and off in recent months. On the other hand I'm always optimistic and part of me thought I could go out there and run a marathon from memory. My goal on race day was to finish somewhere between 4 hours and 4.30. My slowest ever marathon race was my first - 4.15 at Stevenage in 1994. I vividly remember my struggles in the closing stages of that one - it was my first experience of trying to push my body through crippling exhaustion and it's etched in my memory. Twice since I have run even slower than that - 4.25 solo at the Peace Mile around 15 years or more ago and 4.45 at the end of an ironman distance triathlon. My best was 3.16 at Flushing Meadow, aged 40, in the Sri Chinmoy Invitational. Along the way I clocked up several other marathon finishes at 3.49 & 3.59 (NYC), 3.55 (Leeds), 3.45 (London), 3.22 (Battersea) and 3.29 & 3.16 (Rockland, USA). There was also a 3.39 I did when I hadn't trained at a very high mileage and that was achieved on the old Hereford Marathon by doing a 1-min walk after each mile - known as the Galloway Method that helps you avoid "hitting the wall" by giving you brief recoveries throughout the race. Or so the theory goes. With so little running behind me this time I decided to try the same tactic. After a short silence and a "Race Prayer" about Eternity's Road (actually the words to one of Sri Chinmoy's marathon songs, of which there are several) we set off down the Bristol and Bath Cycle Path. The forecast was for rain and gale force winds but to start with it was just blustery and cold. The first sixth of the race came easily enough - 8.30 pace - and I got into the routine of walking briefly at every mile and getting electrolyte drink down me at regular intervals plus a gel every 3 miles. Once I was on the second lap I knew I'd slowed a little but it was only on my way back again - up over the half-marathon distance - that I really noticed I was losing time. Any thought of hitting the 4 hour barrier evaporated and I was hoping I might manage 4.15 but once I started the final lap, with 17 miles in my rather shocked leg muscles, I was down to 11 mins pace and the only realistic target was to finish in under 4.30. Along the way I was really enjoing the run - the anticipated storm didn't materialise and there were many runners and cyclists out on the path so there was a feeling of being part of a bigger event, even though we were only a handful. The out-and-back course meant we were able to exchange a few words of encouragement each time we passed. Kokila was looking in good shape, accumulating miles with a view to completing a half-marathon, her longest run for ages. Suswara was out in front looking like he was working himself hard - he had a great run and clocked 3.29 which was pretty impressive in the conditions. Vilas swung by on his racing bike and took a few photos - and a short vid of me and Kokila passing at around my 15 mile mark. 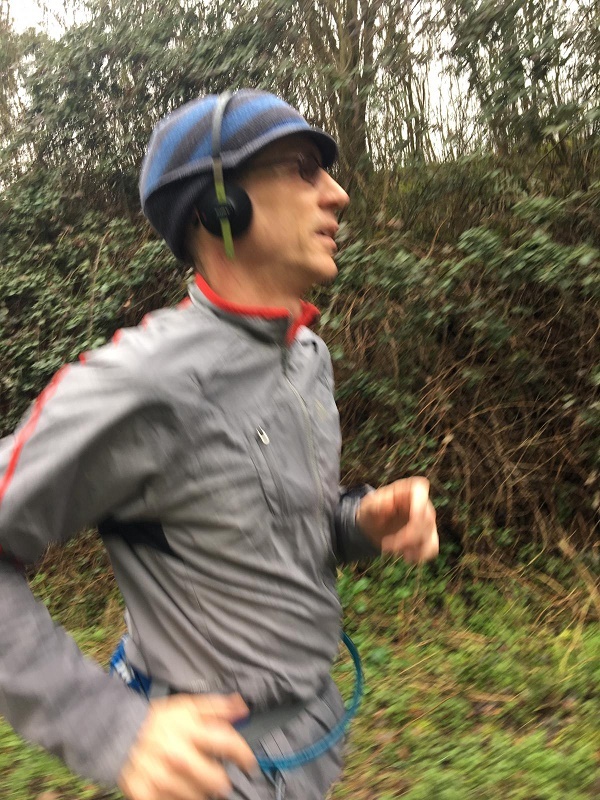 Until the last lap I didn't use headphones - the experience of doing a long run was pretty novel as I was so undertrained so there was no chance of boredom. There were amazing views out across the Avon Valley and all kinds of wildlife too. I knew the last 5 miles were going to be a bit of an epic struggle though so I got the phones on and listened to Symphony for Meditation which had helped me through the 4-marathons-in-1-day adventure at Tooting 14 years ago. Back when I was actually a runner! My stride was shorter than the shortest, my legs had tightened up and my energy pretty much all spent but I was still able to shuffle along at around 12 mins a mile. Sri Chinmoy's words from the Rockland Marathon start (exhorting us to run cheerfully, happily and proudly) and all my marathon experiences down the years were floating through my mind as I jogged on through the fatigue. The end came into view and then with a final surge I crossed the line in 4.22, with not a soul in sight. Straight away I sat down on the ironwork by the railway line and felt the incredible joy of not running after 4 and a bit hours of putting one foot in front of the other. It had been a big effort and I was feeling emptied out, but happy with the result and most of all thrilled that I'd had no injury hassles. It dawned on me that I had actually completed a marathon, something I wasn't even expecting to attempt this year. What a great surprise.